Please welcome today's paranormal guest author Heather Reid. Heather is the author of Pretty Dark Nothing. Heather: My love of words started like most writers I know. It started with a story. In this case, the stories came from the imagination of my great-aunt, Delia. She weaved magical tales to send me to sleep. She wasn’t a writer, she never wrote any of her stories on paper, and she read to me too, but I loved her stories best. Neither of us knew she was giving me the greatest gift of all, the love of storytelling. At the age of four I started dictating stories to my mother who would illustrate for me. By the age of nine, I was writing plays for friends and binding my own picture books with cardboard and string. At eleven I tried my hand at a first novel. (No, you can’t read it. It’s buried in a deep dark hole somewhere in the Tasmanian Outback and guarded by a three-headed dingo.) It was then I told my parents I wanted to be published by the age of sixteen. I also told them I wanted to be Wonder Woman, a Dallas Cowboy cheerleader, a Broadway star, and an archaeologist. Those dreams faded. I never did get that invisible jet, and I would be a lot older than sixteen before I got a publishing deal, but the dream of being a writer stayed with me. After college I decided to stop dreaming and start getting serious. I joined the Society of Children’s book Writers and Illustrators, joined a writer’s group, read books on writing, went to conferences, workshops, and most importantly, I started writing every day. Some of it was crap. Ok, at first, a lot of it was crap, but writing takes work. After over 12 years of studying and writing, my first young adult novel, Pretty Dark Nothing, sold in a two book deal to Month9Books. It’s been an amazing journey and I’m still learning. I write because I have to. It’s a part of what makes me, me. Heather: I’ve always loved scary stories and things that go bump in the night. Maybe it was my way of trying to make sense of the nightmares of my youth. Halloween became my favourite holiday complete with an annual party, haunted house, scary movies, and ghoulish punch. As a teenager, if it had a paranormal story line, I would read it. I graduated from Christopher Pike and VC Andrews to Anne Rice, Stephen King, Dean Koontz, Poe, and Lovecraft, reading every book I could get my hands on. I didn’t stop at fiction either; I collected many a book on real historical hauntings from around the world. Sometimes I think paranormal chose me, not the other way around. Heather: I would love to be a shifter, to be able to fly or swim or run with the wolves as I wished. The ability to experience life from so many different perspectives would truly be awesome. Imagine the freedom of it. I could still live a somewhat normal life if I wished, neither ruled by the moon like a werewolf or blood lust like a vampire. Heather: Pretty Dark Nothing is full of demons, and I don’t mean the hot fallen angel, bad boy types. These demons are the evil, hairy, sulphurous kind, bent on manipulating and destroying Quinn’s life. Throw in some romantic sparks with a psychic amnesic, an ex-boyfriend she can’t quite get over, and suspension from the cheerleading squad for failing grades, all while the demons are pushing her to the brink of madness, and I hope it’s a recipe for something darkly paranormal and not quite typical. Heather: Juno Temple as Quinn Taylor- Quinn is complex and needs an actress who can play someone descending into madness in a believable way. She needs to have moments of vulnerability as well as strength and stubbornness. It’s a delicate balance. It doesn’t hurt that Juno looks a lot like Quinn. If you haven’t seen the indie film, Little Birds, check it out. Her acting is amazing. Stephen R McQueen as Aaron Collier – His work in Vampire Diaries says it all. He can play broody and loveable. Let’s not forget the cute factor. His smile is Aaron’s smile. With the exception being brown eyed instead of green, he’s looks almost exactly how I picture Aaron. I’m sure he wouldn’t mind wearing contacts for the role, right? 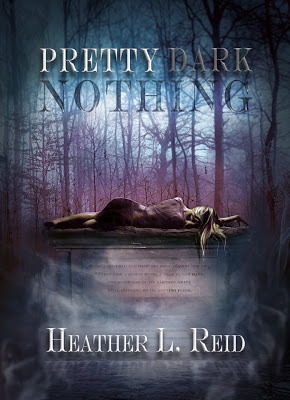 Pretty Dark Nothing by Heather Reid. Seventeen-year-old Quinn hadn’t slept a full night in twenty-three days. She’s terrified of the demons that stalk her dreams and whisper hauntingly of her death. The lack of sleep and crippling fear are ruining her life and her arsenal of energy drinks and caffeine pills don’t make a dent. When Quinn dozes off in the school hallway, Aaron, an amnesiac with a psychic ability, accidentally enters her nightmare. Now the demons will do anything they can to keep them apart. If Quinn can learn to trust her heart, and Aaron can discover the secret locked away in his fragile memory, their combined power could banish the darkness back to the underworld for good. That is, unless the demons kill them first. Pretty Dark Nothing available April 2013. To learn more about Heather Reid and her books, please visit her website. Great interview, ladies! It's true, that three headed dingo almost bit my hand off. Demons just aren't demons unless they're sinister, right? I've always loved scary stories too, Heather. There is something about overcoming darkness that never gets old. Can't wait to read PRETTY DARK NOTHING. Thanks, Brian! It's the darkness that makes us recognize and appriciate the good things in this world. I think that's why a lot of readers are drawn to dark stories, why they never get old. Thanks for commenting and for being awesome. Hope you enjoy Pretty Dark Nothing. Great interview, Heather! Ooh, and I like your choices for actors to play the roles! Awesome! Oooo, so you're all into scary! I'm... not? But enjoy them every now and then. Two of my best friends LOVE scary movies in particular, like "Mama", and they always try and drag me with them. SO NOT HAPPENING.